Was going to get some in the morning @ that price. But amazon have a 4 pack @ £14.00 delivered by prime. So have ordered online dont even need to go out. 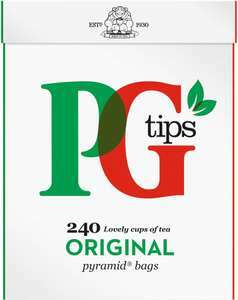 Tried PG loose tea the other day as can't stand these bags, awful in comparison to Yorkshire tea, was hoping would enjoy as was brought up thinking PG was the best. What a grey, bland and weak tea it is, ended up throwing the lot out as would never drink it. Yorkshire loose tea or nothing for a good everyday tea. try Poundland 160 bags for £2.